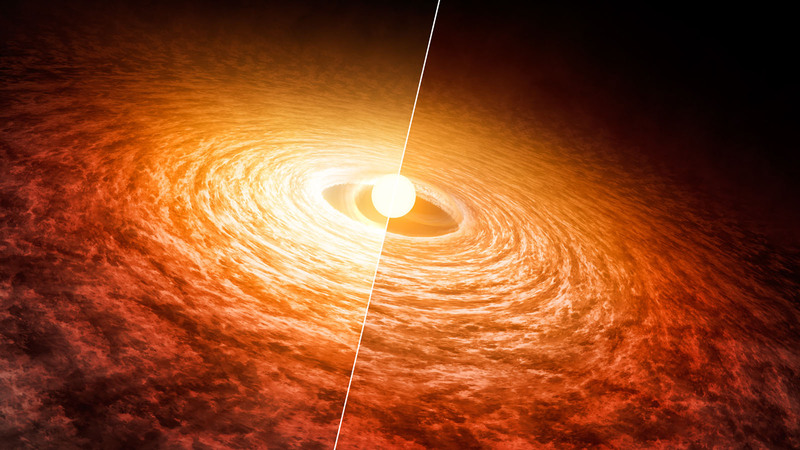 Green and his team compared infrared data obtained in 2016 using the Stratospheric Observatory for Infrared Astronomy, SOFIA, to observations made with NASA’s Spitzer Space Telescope in 2004. SOFIA, the world’s largest airborne observatory, is jointly operated by NASA and the German Aerospace Center and provides observations at wavelengths no longer attainable by Spitzer. The SOFIA data were taken using the FORCAST instrument (Faint Object infrared Camera for the SOFIA Telescope). Green plans to gain more insight into the FU Orionis feeding phenomenon with NASA’s James Webb Space Telescope, which will launch in 2018. SOFIA has mid-infrared high-resolution spectrometers and far-infrared science instrumentation that complement Webb’s planned near- and mid-infrared capabilities. Spitzer is expected to continue exploring the universe in infrared light, and enabling groundbreaking scientific investigations, into early 2019.